The American Revolution is widely understood—by schoolchildren and citizens alike—as having ushered in “freedom” as we know it, a freedom that places voting at the center of American democracy. 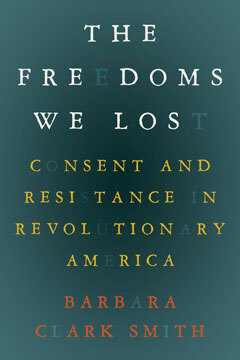 In a sharp break from this view, historian Barbara Clark Smith charts the largely unknown territory of the unique freedoms enjoyed by colonial American subjects of the British king—that is, American freedom before the Revolution. The Freedoms We Lost recovers a world of common people regularly serving on juries, joining crowds that enforced (or opposed) the king’s edicts, and supplying community enforcement of laws in an era when there were no professional police. The Freedoms We Lost challenges the unquestioned assumption that the American patriots simply introduced freedom where the king had once reigned. Rather, Smith shows that they relied on colonial-era traditions of political participation to drive the Revolution forward—and eventually, betrayed these same traditions as leading patriots gravitated toward “monied men” and elites who would limit the role of common men in the new democracy. By the end of the 1780s, she shows, Americans discovered that forms of participation once proper to subjects of Britain were inappropriate—even impermissible—to citizens of the United States. In a narrative that counters nearly every textbook account of America’s founding era, The Freedoms We Lost challenges us to think about what it means to be free.